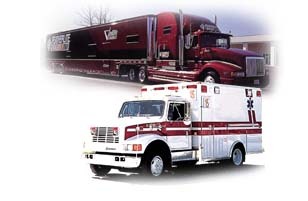 Cruisair's DX Air-cooled HVAC systems are designed to comfort motor coaches, emergency vehicles, broadcast vans and other specialty land vehicles. The product line includes condensing units, air handlers (cooling/heating units), state-of-the-art digital controls and accessories. 14,000 BTU/hr ACA and ACH air-cooled condensing units consist of a refrigerant condenser, compressor and associated electrical and mechanical components in an aluminum enclosure. Models are available in 115V-single phase-60 Hz, or 230V-single phase-50/60 Hz; reverse-cycle heat pump and cooling only models are available. EBU and EBO models are compact, draw-through ductable cooling units with a rotatable, variable speed blower and an integral, insulated condensate pan. EHBU and EHBO models have an electric heat element, which can supply heat when outside temperatures are too cold for reverse-cycle heat. EBU/EHBU models are available in capacities of 7,000 and 16,000 Btu/hr. EBO/EHBO model capacity range is 4,000 - 16,000 Btu/hr. EBH, EFB and EFL cooling/heating units are designed to be used without ducts. EBH blow-through units have a blower mounted behind the evaporator coil and an integral condensate drain pan. UL listed models are available. Offered capacities are 14,000 and 16,000 Btu/hr. EFB and EFL models are compact, fan-type units, suitable for installations where space is more critical than noise. EFB units have a single-fan, and are available in capacities of 4,000 and 16,000 Btu/hr. EFL models have dual fans, and are available in 1,000, 14,000 and 16,000 Btu/hr. For more detailed information about DX Air-Cooled products, see the product specification sheets on the right of this page. The 1987 Montreal Protocol calls for the gradual phase-out of ozone-depleting substances by 2010, including the R-22 gas traditionally used in marine air conditioning systems. Our engineers have been testing alternative "green gas" products for more than three years and we have products available. For "green gas" and all other product availability, Contact Us for the best specifications for your particular vessel. See the link in the bottom right hand corner of this page for Charging Systems with Alternate Refrigerant guidelines. Tropical Marine Air Conditioning, Inc. services and sells marine equipment and Cruisair Parts- Marine Air, AquaAir, Technicold, and Cruisair air conditioning, refrigeration by U-Line, Spot Zero and Sea Xchange, ECOmar Sewage Treatment Systems, and ice machines Eskimo Ice. CONTACT US for your marine parts and equipment needs.